Dac Biet Pho, originally uploaded by wEnDaLicious. Well, I don't, but I would if I ate meat. This is a great choice for a cheap dinner. Hot soups are actually cooling during hot weather. Really! This dish is from Nha Trang on 8th Avenue at 59th Street. 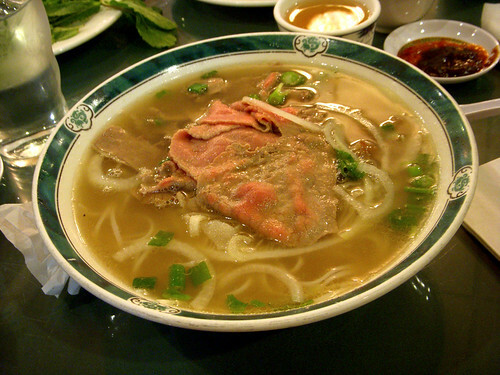 Wow, that pho looks delicious! I'm a non-meat eater in the neighborhood too. Can you recommend any Asian restaurants with actual veggie options...not "tofu with shrimp paste" or things to that extent? P.S. I'm so glad I found your blog - I love it!